With two-months left in the fiscal year, the USPTO is on-track for another 300,000+ patent year. 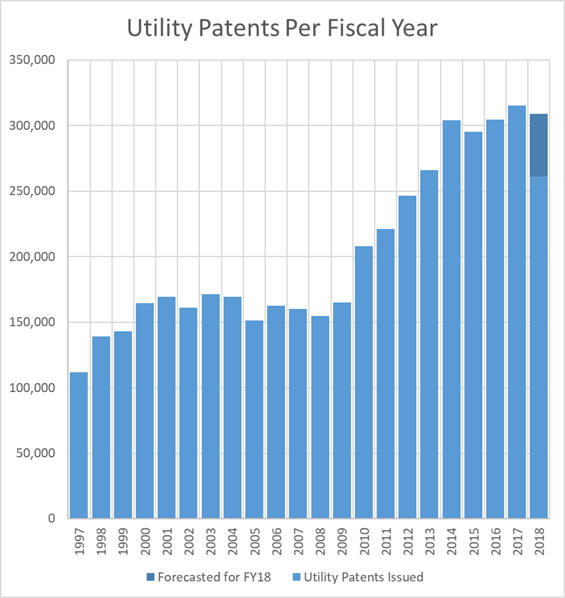 The chart above shows the number of utility patents issued each fiscal year for the past two decades. The current forecast for FY2018 is a bit below FY2017 – but still the second highest number of patents issued in a single year. Examiners will push to make their quotas prior to the end of the year – however those will not be reflected in issued patents in FY18 because of the lag between allowance and issuance. It really is misleading to post a chart of the number of utility patents issued as a measure of the health of the US Patent system. Anyone–like me–that works on the front lines knows the patent system is on its knees right now and that these numbers are distorted because of China and other other countries vastly increasing the number of US patents they are filing. Again–highly likely–that US original filings for inventions made in the US are likely significantly down since 2012. Note that Lemley runs about pushing that these number indicate that the patent system is fine and all the weakening hasn’t lessened the number of patent applications filed. Again–the measure should be patent applications for inventions made in the US–which I am sure is way down. The Chinese have been flooding us with patent applications of inventions made in China. What does the origin of the filing have to do with the strength of the patent system? Are you saying that US firms are not filing patents because the patent system is weak, while Chinese companies are filing patents… because the patent system is weak? If patents are presumed valid, i.e. novel and non-obvious, then there seems to be no need to worry about the Chinese-based patents because they are only be granted to inventions that deserve patent protection. Only the good stuff will make it through the process. Quid pro quo. They are teaching US firms how to make and use those innovative processes. While the squirrel has a point (the goodness of MORE patents is true regardless of to whom the patents go to), the squirrel misses the point as to the nature of entities having an impact on how the system is being played. If the system is being gamed by those outside of the US (and outside of the DIRECT benefit to the US Sovereign), then infirmities as being introduced by the courts will be masked. Keep in mind that obtaining a patent is NOT the be all and end all and (gasp) enforcing patents (yes, even with lawsuits) may often be an appropriate test. Which is yet one more reason that the Efficient Infringer propaganda of “O H NOES Tr011” is so deleterious. Too e ff ing funny. Your cognitive dissonance is showing again, Malcolm. The point is Squirrel is that the graph is misleading. The number of patents being filed in the US for inventions made in the US is down. How far I am not sure. The primary goal of the patent system in the US is to promote innovation in the US. Must you always fabricate things, Squirrel. The point is Squirrel is that the graph is misleading. The number of patents being filed in the US for inventions made in the US is down. That’s not the fault of the graph. You know: something really intelligent sounding that would play nicely at your next k l@n meeting, for example. Did he say it was the “fault” of the graph? You are simply far too quick to want to cast derision that you miss a valid point being raised. Maybe instead of trying so very hard to be a blight on these boards, you stop before you post and think about what your post ADDS to any ongoing conversation. If your post is merely mindless ad hominem, do NOT hit the “Post Comment” button. It may be difficult for you, but exercise just a touch of critical thinking and self-constraint. Funny, I don’t see that in the text of the Constitution anywhere. The so-called IP clause seems to be location neutral (and yes, before Anon condescends from his throne on high where he sits at the right hand of the almighty, that was a joke). Even presenting the chart as you suggest would be misleading if the point was to comment on the state of innovation vis a vis the patent system. It would be a simple and naive view of the world if you were to be of the opinion that the patent system is the only or dominating reason behind innovation in the US. Oh yeah, I forgot, everything on this blog must be as you demand it. You say it was a joke, but apparently still believe that your statement is true as if it were not a joke. Before you cast stones about “simple and naive” world views, you would do well to check yourself. The bottom line is that having a strong patent system IS linked to having an innovative culture. And the US experiment DID produce one of the most innovative cultures that the world has ever seen. Sure, the interplay is complex, but that does not mean that the interplay is not there, nor does it mean that warnings given the current downward trend of innovation protection mechanims are somehow inappropriate. Having a “strong” patent system is one factor to having an innovative culture. Though, without any qualification, the word “strong” does not really mean much. To me, a strong patent system is one that produces enforceable, clearly delineated claims that POSITA can understand the boundaries of by applying a rigorous, consistent examination process. A weak patent system produces ambiguous claims that have poorly defined boundaries which can be molded by argument. I would posit that immigration is positive factor that is linked to the US having an innovative culture. [W]ithout any qualification, the word “strong” does not really mean much. Too true. I rather wish people would simply stop using the words “strong” and “weak” with regard to patents. The words mean a million different things in a million different mouths. “Strong” and “weak” confuse more than they clarify. An excellent point. I am fundamentally in agreement with the proposition that the U.S. patent system is a net good for society, but so many of the arguments for the U.S. patent system make no logical sense. Foreigners are just as able as U.S. citizens to obtain U.S. patents, and foreign patentees derive just as much benefit from their U.S. patents as do U.S. patentees. Therefore, the U.S. patent system cannot (as a matter of logic) account for the U.S. edge in innovation. Obviously, however, the U.S. produces much more innovation than most other countries, even on a per capita basis. If one wishes to account for that superior degree of innovation, then, it logically follows that one must look to some other explanation than the U.S. patent system. For my money, the relative ease of immigration is the single biggest reason for our innovation edge. The fact that (until quite recently) we also spent more than the rest of the world combined on public funding for science is probably also a big factor. Unfortunately, we are currently dismantling both of those understruts that support our historical competitive advantage. No wonder, then, if U.S. innovation is declining. Deleterious changes to patent law will not help in that respect, but really they are simply beside the point to the general decline. That these legal changes happen to coincide in time with the decline is largely a coincidence, not a cause. ??? Where is the logic in that? It is quite the opposite, especially given how the US experiment embraced the Private personal property nature at the onset (and notwithstanding your attempts to use “franchise” quotes out of context or how that word is understood today). No Greg, the patent system is more important and not less as to its link with US innovation. Nonsense. The goal is to promote innovation, full stop. One can tell that your view of the patent laws is incorrect simply by reading them. If the patent law were intended to prefer U.S. inventors over non-U.S. inventors, then the statutory text would say so. It does not say so for a very good reason: U.S. citizens benefit from foreign innovation just as much as we benefit from U.S. innovation, so we have just as much of a sovereign interest in promoting ex-U.S. innovation as we have of promoting U.S. innovation. Greg, just nonsense. Get off your high horse and don’t lecture me as if you are some more caring or liberal person. I won’t argue this point here with you as all I am asking is for a graph that shows US inventions separated out. But you have no idea what you are talking about. Your “full stop” is simply not correct. Patent law is, remains, and ever shall be, a sovereign-centric law. Greg’s comments are just ja ck a$$ dom. Just total nonsense. I suppose the SCOTUS could put as part of balancing test how a law would affect a foreign country or innovation in France. Greg—seriously–rethink your self-destructive liberal better than thou attitude. You are the type of person that created Trump. People hear your views and are repulsed as they can tell that you care about getting yours and burning down the USA. Rethink what you are doing. You are a fo ol. You have no idea what you are talking about Greg. None. Go read the Constitution again. Nothing about the US inventions in there. Point me, please, to where in the constitution I will find the clearest refutation of the position that I am advancing in 5.2.2.3. Meanwhile, my 5.2.2.3 argued that you are incorrect in your understanding of the law. I neither implied nor contend that you are somehow “illiberal” or “uncaring” for this mistake. If you read such an implication, I assure you that you were over-reading it. So–I’ll answer your “questions” directly. “What does the origin….” I told you in my post. It is misleading in that it appears that patents for inventions made in the US is not going down. “Are you saying that US firms are not filing patents because the patent system is weak?” Yes I am saying that. I see that first hand. But, I would say filing fewer patent applications and to some extent removing patents from their processes. “while the Chinese comparies are filing patents … because the patent system is weak?” No I didn’t say that. The Chinese are on their agenda and to them the value of US patents is still worth filing. The Chinese government is trying to build a healthy patent system and encourages –gives money–for filing in the US. “… see to be no need to worry about the Chinese-based …” I didn’t say I was worried about the Chinese patents. I said their filings masked the fact that fewer US patent applications are being filed for inventions within the US. I am never sure Squirrel if you intentionally try to blow smoke to obscure the arguments or if you genuinely are incapable of understanding straightforward posts. When I read your posts I do get a sense that you may be mentally ill or have a serious mental disability. I don’t see the mental illness. I do see an anti-patent bent, and a willingness to quaff the Kool-Aid of the Efficient Infringer mantra, coupled with someone who lacks a fundamental understanding of how law works. He is quite the lemming that happily marches up the cliff side while downplaying the importance of innovation and innovation protection system like strong patent systems. I would say that I have ability to questions the assumptions that underpin the system. Not merely accepting the declarations of people who support a “strong” patent system is not the sign of a lemming. I don’t downplay, I just don’t assume that the minimalist view of the patent system is true just because they tell me it is. So, if you think about it, I would be a lemming if I unquestionably believed ed what you tell me. Your “questioning of assumptions” speaks too highly of what is in actuality your simply not being familiar enough with law. The lemming part comes in in other manners (for example, you do NOT question the assumptions of the anti-patent rhetoric, but all too eagerly glom onto such exhibiting no thought whatsoever). It’s less a matter of “just believing” and more a matter of you educating yourself. Once you do that, then you would realize the my statements are in accord with the law. You would NOT be “merely accepting what I say” because I say it, but you would recognize THAT I say it because it is accurate and true. Huge difference, and one that requires you to move from having your uninformed opinions to having informed opinions. Not being familiar with the law and questioning the underpinning rationale of the law are two different things. That is a point you often miss. The law, especially patent law, is not a revelation handed down from the divine. We should question the law, even law we agree with. Your whole MO is to stifle conversations about the law by saying those who dare question it don’t understand it. I miss no such point Squirrel. How do you propose to question underpinnings if you cannot tell what those underpinnings are? Or if you are unable to understand why the underpinnings are underpinnings? As to my “whole MO” you could not be more wrong. I am the one that constantly seeks to have people engage on the merits – as opposed to the drive-by monologue of posting a view and then refusing to acknowledge the counter points presented. You confuse my call for you to have an informed opinion with one to not have an UNinformed opinion. It is those that merely want to have – and keep – an uninformed opinion that earn my ire. It is those that do not want to engage that earn my ire. Your statement here twists that and is beyond wrong. Disagreeing with Anon does not make you uninformed. That’s a pretty strawman that you have built. You can’t deny that your post has subtext. I just want you to make your subtext into actual text. You have these… well the kind of way of saying it would be “original” thoughts about the nature of the patent system that are not always as clear to the outside observer as you imagine. I just pose questions so that I can get into the inner mind of Night Writer to see what, if anything, is ticking. Sadly, squirrel, your statement is clear error. When one understands the legal context, calling the Supreme Court “the Royal Nine” is the opposite of mentally ill. I do not consider you mentally ill for having this incorrect view though. Here, you are simply wrong and simply ign or ant as to why you are wrong. Ps: what you call “subtext” is merely having a working understanding of the CONtext of law. Yes, often conversations are engaged without “translating” all of this context for those without legal understanding. But in a way, that is a limitation on your part and YOU need to work to overcome that limitation. Maybe you can become more than an ordinary squirrel, or leastwise, learn to recognize those situations in which your ordinary understanding is simply not sufficient to have a meaningful (and meaningfully informed ) opinion. The term “Royal Nine” is the product of delusion. Simple as that. You engage in a lot of sophistry in your faux-ivory tower. I understand the subtext on the original statement. Still, I want the subtext to be out in the open for the world to behold. Your entire engagement on this issue is a master course in fallacy in argument. You assume that if one does not agree with you, then that person does not understand the subject well enough. Your are adept of being condescending, in a hollow way, as a tactic to shut down discussing on issues you are uncomfortable discussing. Your fiat declaration of “as simple as that” is based in pure ign or ance. You celebrate clenching tight your eyes and then wonder why those wanting you to open your eyes hold you in disdain. …and again you are simply wromg as to somehow me not wanting engagement. Given your fiat, it appears that you are projecting here. It is equally misleading in that it appears that patents for horse-and-buggy inventions have not essentially vanished. My horse-and-buggy is configured so it can be monitored from a distance with a securitized handheld wireless device that is connected to a remote server. Yes MM and in 1890 a “securitized handheld wireless device” that is “connected” to a “remote server” would have all been just so obvious. Your arguments are just so lame MM. Yes the anti-patent forces have won and we are close to not having a patent system. But that doesn’t mean your arguments are right only that your money is green. The Chinese are on their agenda and to them the value of US patents is still worth filing. The Chinese government is trying to build a healthy patent system and encourages–gives money–for filing in the US. Not to put too fine a point on it, but this is at best a non sequitur relative to the point you are trying to make. Why are U.S. patents “still worth filing” for Chinese firms if the U.S. patent system is as weak as you say? What tangible good does a “weak” U.S. patent get them? Until you can give a cogent answer to this question, your own post are just as much blown smoke as you would accuse Mr. Squirrel’s of being. Meanwhile, to say that “[t]he Chinese government… gives money… for filing in the US” is no answer to this question. It merely moves the question to one degree further remove. Why does the Chinese government give money for U.S. patents? How does filing in the U.S. help “[t]he Chinese… to build a healthy patent system…”? These questions need answers before your argument can hold any water (or even make sense). What are the answers? Of course, the annual numbers will benefit for the same exact reason due to the lag between allowance and issuance for FY17. It might be interesting to chart separately this “lag” effect, although, chances are that it may well mirror the overall trends. I wonder what the numbers look like for design patent filings in light of Apple v. Samsung ? We know that foreign applications are way up. So the question is what does this chart look like with applications that claim foreign priority? What does it look like when original filings are for inventions made in a different country? I think that the number of US patents for inventions made in the USA is actually significantly down since 2012. Be interesting to see a chart of granted US utility patents for inventions made within the USA.